Genie Super Hoist: The original Portable Hoist. The Genie brand was born in 1966 with the original Genie Hoist, a unique portable pneumatic lift that was so successful, it launched the development of a full range of material hoists and aerial work platforms. An easy to release leg lock that contributes to the ease of storage because the legs are moved out of the way during storage. Each piston inside the cylinder has an auto lubricating oil reserve. 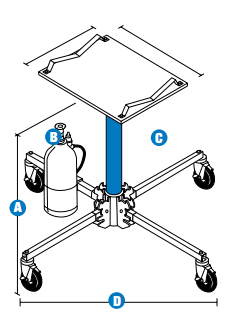 A single tank of CO2 will provide approximately 80 to 90 lifts. It also supports common CO2 bottle sizes with its one size fits all bracket. The Genie Super Hoist allows one person to lift and move heavy loads.